It's fair to say Moon Dog has explored many facets of the IPA world over the years. The brewery's first ever bottled release was the cognac barrel aged double IPA Skunkworks and since then there's been the likes of the core-range-for-a-while Jukebox Hero and the most recent Jumping The Shark, a multiply freeze distilled IIIIIIPA (we think that's the appropriate number of I's...). 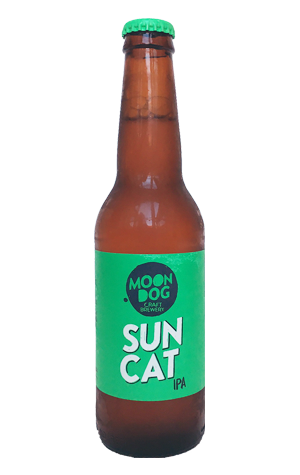 And now there's Sun Cat, a beer that's been in development for some time, mainly as a series of beers bearing the name of the brewery dog, Tess. The winning Tess chosen to become the new core range IPA was version III (we definitely got the right number of I's there) and she's a tropical drop. Based around punchy US hops Mosaic and Azacca, the bottle we cracked within a few hours of it leaving the brewery seemed to have retained so much of their fruity goodness it was as if the oils had been squeezed straight from hop cones into the tanks. The label speaks of pineapple and mango; to that, you can add an upfront lively, sherbety sweetness and that candy blackcurrant creme character we often associate with heavily Mosaic'd beers. There's enough lingering bitterness to let you know it's an IPA, however, the sort of IPA that was the rage before NEIPAs took bitterness out of the equation. Enough, in fact, that it leaves your palate dry as a bone. And other good beer outlets in VIC, QLD, NSW, SA, TAS & WA.